Hail to the Gods! It’s the Kingdom of the Titans Slot by WMS Gaming. Online gamblers looking for big bonuses will love this one. First of all, the game offers a rather high max payout of 250,000 per wager. In addition, the unique Spinning Streak feature gives you an extra chance to win after each winning payline. Unfortunately, those who expect outstanding graphics should give this one a pass. combination. WMS Gaming (aka Williams Interactive) released the Kingdom of the Titans Slot back in 2011, and it still offers a great online casino game for those who love big payouts and bonus features (and who doesn’t?!). The Kingdom of the Titans Slot features 5 reels and 30 paylines paired with graphics from Ancient Greece. The overall theme and atmosphere of the Kingdom of the Titans Slot Game transports players to Ancient Greece. The graphics recreate symbols of Greek antiquity, with olive wreaths, lyres, golden armor, and Greek Gods. Released back in 2011, the look of this game seems outdated, and the images appear quite simplistic. That being said, the theme has redeeming qualities and still offers some excellent online gaming. The trumpets play as the reels spin, complimenting the theme. 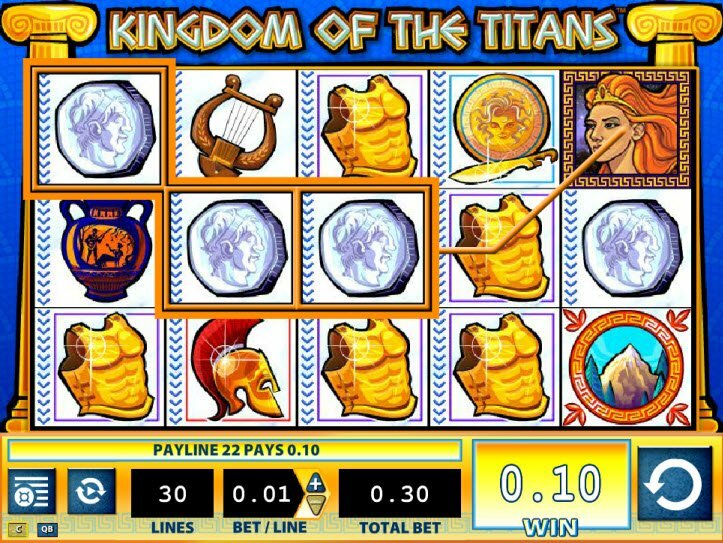 With a max payout of 250,000 per wager, the Kingdom of the Titans slot machine is worth a spin. Where this game falls short in graphics, the Kingdom of the Titans bonuses more than make up for it. 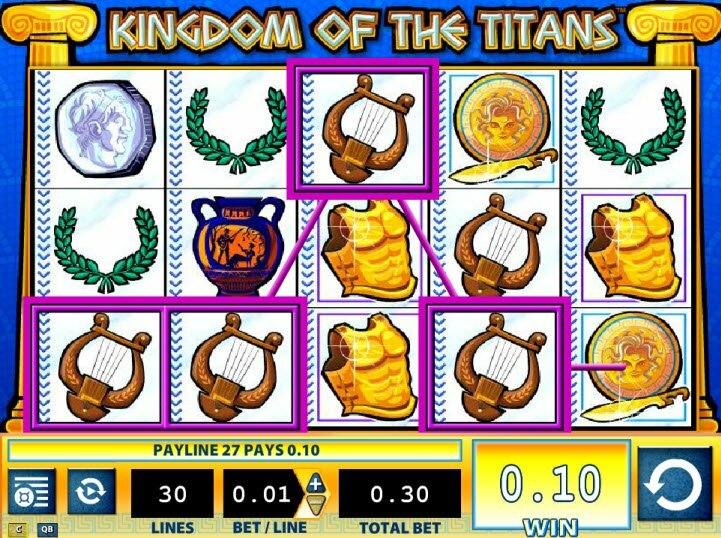 With a max payout of 250,000 per wager, the Kingdom of the Titans slot machine is worth a spin. The Kingdom of the Titans logo serves as the Wild and substitutes for all symbols except the Feature. This symbol only appears on reels 1, 2, and 5. 5 or more scattered Feature Symbols triggers the Free Spin Feature. Those who land on the maximum number of Features can receive up to 50 Free Spins. You’ll recognize this special symbol because it has a picture of Mount Olympus. 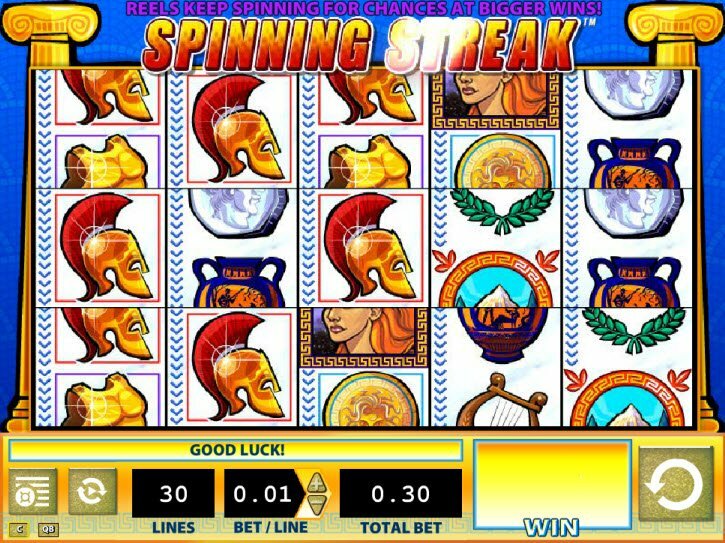 The Kingdom of the Titans Video Slot also includes the Spinning Streak feature. This unique feature triggers after a winning combination. The winning symbols lock into place while the rest of the reels go for another spin. This additional spin comes free of charge and gives another chance at winning again.